Tarh Clan academic achievers of 2017-18 and other achievers were felicitated by Tarh Welfare Association (TWA) in a function at Tosum Hotel, Naharlagun today. Academic achievers included class-X –Tarh Mhenu (91.6%), Tarh Ramji (87.8%), Tarh Jangang (87.2%), Tarh Amar (83.6%), Tarh Ampung (82.4%), Tarh Nyanya (80.2%) & Tarh Bima (78.4%); class-XII – Tarh Tapung (86.8%), Tarh Tayang (81.8%), Tarh Aku (72.4%), Tarh Kaki (71.6%) (all Sc), Tarh Yami (72.6%, arts) and NEET qualifier – Tapung – 1676 (ST category). 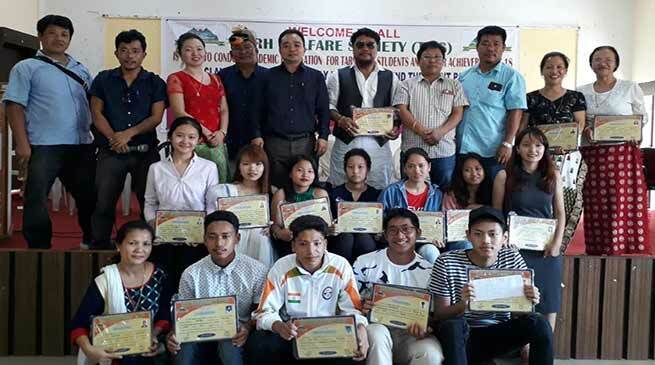 Other successful career achievers were Tarh Nachung (state gold medalist), Tarh Chakum (state silver medalist), Tarh Chachu (MBBS), Tarh Sagma (botany assistant Prof), Tarh Chunia (Arunachal Idol 2nd runners up), Tarh Ror (Kurung Kumey Idol) and Tarh Eliya (global 2nd position holder in karate). Addressing the gathering earlier, TWS convenor Tarh Nachung said that the felicitation aimed at encouraging the young generation to face the too competitive present IT era. Hard work and commitment have no alternative but only key to success, he said. He exhorted the academic achievers to pursue higher studies with commitment to rise to higher ladder in life. But, you all are expected to serve the society after becoming professionals in your respective fields, he said to the thunderous applause of the gathering. This annual feature of the TWS to felicitate success stories of achievements is recognition by the society which is much greater than sona and chandi, general secretary Tarh Tarak said, adding the TWS intends to end dependence syndrome of the GenNext on their elders and parents. TWS vice chairman Tarh Miri and education secretary Tarh Mabu also lauded the achievers.